Rooibos tea has won geographic indicator status from the EU. A food contamination scandal in China spreads abroad. Restaurant workers’ wages are stagnating. Stop telling women what to eat. The threat to Market Basket. Refrigeration, dumplings, and climate change. Two thirds of Americans are avoiding fizzy drinks. Which meat should we eat? Why is Nando’s so popular in the UK? Recipes for a summer party. The burger joint name generator. Ending an addiction to Diet Coke. Wole Soyinka on bread in Paris. The difference between sorbet and sherbet. The state of soul food. Everything you need to open a hipster bar. Where to eat in Boston. New York’s 1859 Piggery War. What a trendy restaurant looks like. How restaurants increase sales in summer. Food not to throw away. A guide to New York’s dive bars. How to cook a basic pot of rice. Things to know about spatulas and wooden spoons. Joan Didion on Martha Stewart. What is so delightful about tiny food? A celebration of ice cream. Once the project begins, the families on the farm will be monitored for five to 10 years. With a diet high in offal – which is readily available in the farmlands of the Karoo – the families will stop consuming carbohydrates, which Noakes says are of no benefit to the human body. Since the emergence of nutrition as a field of scientific enquiry in the early twentieth century, the poor, the hungry, and the socially and politically disenfranchised have often been the subjects of research into diet and malnutrition. Last year, University of Guelph-based food historian Ian Mosby published evidence that during the 1940s and 1950s, scientists working for the Canadian government conducted a series of experiments on malnourished residents of rural Aboriginal communities and residential schools. These included canned tomatoes (or grapefruit juice), rolled oats, Pablum [baby food], pork luncheon meat (such as Spork, Klick, or Prem), dried prunes or apricots, and cheese or canned butter. In Great Whale River, the consequence of this policy during late 1949 and early 1950 was that many Inuit families were forced to go on their annual winter hunt with insufficient flour to last for the entire season. Within a few months, some went hungry and were forced to resort to eating their sled dogs and boiled seal skin. Perhaps unsurprisingly, there is little or no evidence to suggest that the subjects of these research projects consented to being part of them. In response to these findings, mining companies introduced supplements to miners’ diets to combat scurvy and generally boost immune systems. They did not, obviously, address the causes of miners’ ill health and poor diets – which were partly the impoverishment of rural areas and the system of migrant labour. 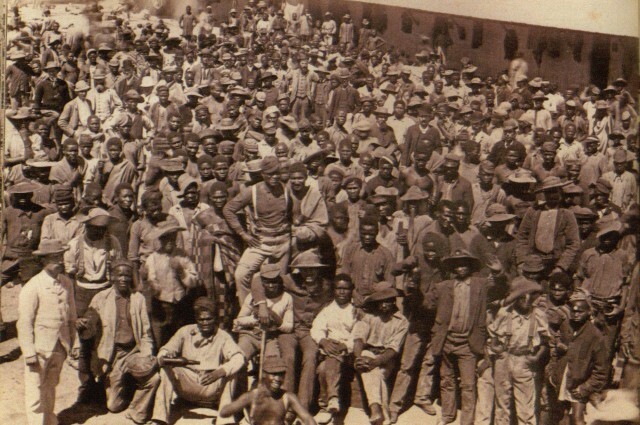 The Canadian experiments and South African research projects were produced by a similar set of concerns: by an interest in civilising indigenous people, but also because, in the case of Canada, ‘it [was their] belief that the Indian [sic] can become an economic asset to the nation.’ Africans also needed to be well fed and kept healthy for the benefit of the South African state. Noakes is correct when he says that conducting the research he proposes to do on rural farm workers would be almost impossible in a city. Although he insists that he will seek ethics approval, I wonder how he and other researchers will go about winning the informed consent of a group of people who are dependent on their employer – Noakes’s collaborator – for their livelihoods, and who have, historically, very low levels of education. Also, Noakes seems to believe that only carbohydrates are at the root of farm labourers’ poor diets. As the First Nations people referred to above argued, malnutrition is caused by an inability to access good, nutritious food – and usually because of low wages. Instead of feeding Carstens’s employees offal, it might be worth considering how much they are paid, and how easy it is for them to afford transport to shops selling healthy food. Noakes argues that ‘We can’t build this nation in the absence of sufficient protein and fat.’ To what extent is this project purely for the benefit of Karoo farm workers? And to what extent to prove a controversial theory proposed by a prominent researcher? Ian Mosby, ‘Administering Colonial Science: Nutrition Research and Human Biomedical Experimentation in Aboriginal Communities and Residential Schools, 1942–1952,’ Histoire Sociale/Social History, vol. 46, no. 91 (May 2013), pp. 145-172. Diana Wylie, ‘The Changing Face of Hunger in Southern African History, 1880-1980,’ Past and Present, no. 122 (Feb. 1989), pp. 159-199. The UN has reduced refugees’ rations to 850 calories. A new contaminated food scandal in China. Give up beef massively to reduce carbon footprints. It is possible and necessary to reduce antibiotic use in farming. The new Australian guide to healthy eating. A South African guide to seasonal eating. French restaurant bloggers are nervous. Whiskey and crisps with Nadine Gordimer. How to buy white chocolate. Cooking and eating during wartime rationing. Celebrating Germany’s World Cup victory with cake. In praise of sourdough bread. Molly Wizenberg’s favourite recipe books and food blogs. New Tempting Ways to Serve Bananas. How to make coconut milk. A recipe book from the Urals. The joy of homemade ice cream. A ten-layer ice cream cake. I realised that I am a kind of wine snob when I moved to Joburg last year. (A year! I’ve been here a year. It’s been interesting, Joburg.) At a party I was asked if I wanted ice in my white wine. Having been raised in the Boland – one of South Africa’s oldest and most popular wine-producing regions – I know enough about wine to feel fairly strongly that it shouldn’t be diluted with water. Most of my knowledge about wine I’ve learned thought being around my father and sister – whose blog you must read – and from spending a childhood in a region where we would spend Saturday mornings visiting wine estates in the area, where there were goats and ducks to feed, and my sister – an oenophile with strong opinions at the tender age of five – would have the odd sip from my father’s glass. This was a time just before wine estates – and South African wines more generally – were marketed to foreign audiences. The standard guide to local wines – Platter’s pamphlet-sized annual rating of all the wines produced in South Africa – was only a centimetre thick. It’s now a dense, detailed compendium of a vast array of regions which had yet to come into being in the late 1980s and early 1990s: the Breede River Valley, West Cost, and Hermanus, for instance. It was a time when my sister and I could wander into the cheese room at Fairview, have a chat with old Mrs Back, and then see what wine my father was tasting. Now, though, the winelands are a standard feature on tourists’ itineraries – after the delights of Cape Town and just before safaris in the northern provinces, quickly skipping over altogether more complicated Johannesburg. They have been used to denote a particular kind of South African-ness (or, more accurately, Cape-ness) of being at once part of an experience that is African and reassuringly European. They are Africa-lite. The use of the wine industry to construct a version of national identity is not particular to South Africa. In When Champagne became French: Wine and the Making of a National Identity, Kolleen M. Guy argues that, contrary to official histories of the French wine industry which portray it as forever having embodied the very essence of French-ness, the notion of French identity being expressed through its wine is a relatively recent phenomenon. As an international market for expensive champagne began to emerge in the second half of the nineteenth century – and as mechanisation of the wine industry allowed for increasing volumes of wine and champagne to be produced – the export of these luxury goods became increasingly associated with what it meant to be French. These luxury goods were taken up to indicate France’s commitment to good wine and to good eating, as a prosperous nation which, although fully modernised, still relied on the work and wiliness of its peasants to produce goods for an international market. The idea of terroir was particularly important in constructing France as a nation with a uniquely perfect food culture: only French soil – and no other land – could produce wines as distinctive as France’s. These narratives hid fractures and changes within French society, as the new middle class sought ways to manifest their wealth and, they believed, their sophistication. Wine is another boon of the Persian South. Its fame has spread and etymologists argue as to whether sherry derives its name from Xerez or Shiraz. So far we have discovered three varieties here: a very dry golden wine, which I prefer to any sherry, though its taste is not so storied; a dry red claret, nondescript at first, but acceptable with meals; and a sweeter vin rose, which induces a delicious well- being. Gonbad-e Qabud, Maragha, Iran (from here). Many believe this rugged area of southern Iran was the original source of the grape used to create the world-famous Shiraz wine – today produced in vineyards in California, Australia, France and South Africa. The claim is disputed by some experts, who believe the grape to have originated in France. What is not in doubt, however, is the central place of wine in an ancient Persian culture held dear by many Iranians. Iran’s most revered poet, Hafez, wrote voluminously on wine’s virtues, as did several of the nation’s other prominent bards. Even Ayatollah Ruhollah Khomeini, the famously ascetic father of the revolution – and an amateur poet in his spare time – composed verse praising ‘wine bearers and wine shops’, although it is widely assumed his references were allegory for the spiritual joy of religious belief. The 1979 revolution banned the production and consumption of alcohol in Iran. Some religious minorities are allowed to serve alcohol at private gatherings, and there is a thriving trade in smuggled wine and spirits. 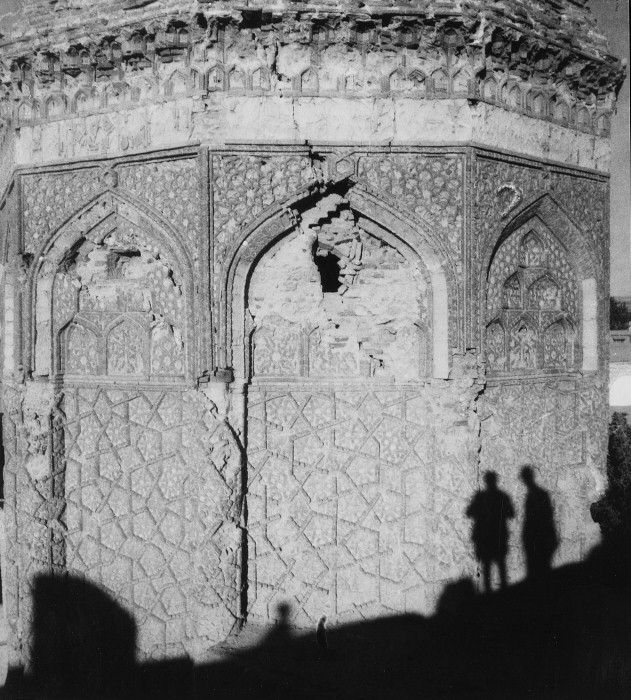 The Road to Oxiana was published in 1937, and it is in many ways a melancholy read at the beginning of the twenty-first century: several of the mosques, monuments, and tombs described by Byron have been destroyed during recent conflicts. And the relative religious tolerance he refers to has disappeared, particularly in Iran, Iraq, and Afghanistan. The odd presence of Persian wine in the book is a reminder of a more complicated past than the current regime would like to allow. I don’t want to make a glib point about using food to understand common heritages and shared histories, but, rather, at this moment of stand-offs, of stupid, pointless attack and destruction, that it’s worth paying attention to how narratives of national strength and vulnerability are constructed. Like Persian wine, they are often based on erasure and distortion. The grotesque opulence of London’s restaurants. The true cost of a burger. America’s favourite foods. And Americans should eat more vegetables. The value of school feeding programmes. Why food in the US is becoming more expensive. Will crickets be the next popular snack? On Crumbs, a documentary about a South African bread cartel. There is a lot of sugar in soft drinks. Will people switch to lab-grown meat? The rise and rise of sour espresso? Accidentally ingesting a poisonous plant. A guide to African cuisines. A phone travels around the world in a shipment of grain. A guide to summer fruit. David Lebovitz on living in Paris. A carpenter bee, covered in pollen. How to confuse a tomato. The joy of British puddings. Things to do with avocados. The women who have fed Austin. How to make iced coffee. Recipes from the Wellcome Library’s collections. Photographs of street food in London. A century of the fridge. Thomas Jefferson’s recipe for vanilla ice cream. When I lived in London and commuted between Holloway Road and Goldsmiths in Lewisham, one of my favourite moments in my journey was when the train slowly rounded the bend into Cannon Street Station. On my right, the skyscrapers and churches of the City came into view, and if I looked quickly, I’d spot the spindly, delicately ornate spire of St Bride’s Church in Fleet Street, traditionally the spiritual home of Britain’s journalists. I’ve been thinking of St Bride’s rather a lot recently. This is turning out to be a year of weddings: my best friend’s in Canada, my sister’s in February 2015, and at least two in-between. Although four very different weddings in terms of size, formality, and religiosity, I’ve been amused by how vehemently each of the couples has not wanted an old-fashioned wedding cake. Cake and sweet things have been eaten at weddings around the world for thousands of years, to symbolise fertility, wealth, and a sweet life for the couple. But the vogue for large, white wedding cakes is a more recent phenomenon. What we think of as traditional wedding cakes originated in Britain during the Victorian period, and was based on the sweet, fruit-heavy bride’s cake served at early modern weddings to ensure the luck and fertility of the bride. 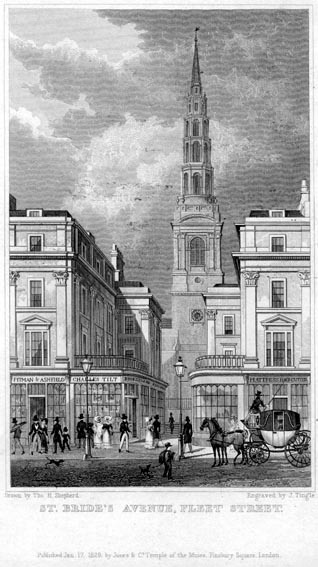 The myth is that William Rich, a baker apprenticed near Christopher Wren’s St Bride’s church with its tiered steeple, modelled his own multi-layered wedding cake on Wren’s design. Simplified designs were copied by an emergent Victorian middle class, eager to show off their good taste and wealth through increasingly elaborate weddings. These cakes were expensive: white sugar cost more than the unrefined brown, and bakers needed to be trained in the art of piping royal icing, a fashion imported from the continent. The double layer of marzipan and royal icing had a practical function too: not only were pieces of cake sent home with guests and to family and relations far away, but the top tier of the cake was kept for the christening of the couple’s first child, or to be eaten a year later for luck. As the meanings of weddings and marriage have changed, so has the significance of wedding cake. At recent weddings, I have eaten carrot, chocolate, and red velvet cake. Although decorated elaborately, these are not cakes to be kept, but rather to be eaten as pudding at the end of the reception. But although couples are choosing to reinvent wedding cakes, these cakes are as full of meaning as they were in the nineteenth century. Culturally, young adults of all social classes and income levels are less likely to think of marriage as the ‘cornerstone’ of their lives – that is, the first thing they do as adults. Instead, people now think of it as a ‘capstone’ – sort of a trophy for having earned a BA, obtained a job, and generally learned to live on their own for a while. As a result of this, weddings are intended to express the likes and enthusiasms of the couple, from their clothes to the cake they serve at the reception. If anything, weddings have accrued more meaning as they occur later in couples’ lives and relationships. The irony, though, is that the enormous wedding-industrial complex which has emerged in recent years to facilitate these increasingly elaborate middle-class weddings, has worked to settle a particular conformity on them: from the artfully posed engagement and wedding photos, to the matching outfits for attendants, and the painstaking attention to every detail from confetti to favours for the guests and the fonts used on the stationery. My point is that wedding cakes are a particularly useful means of demonstrating how weddings are used to denote a range of meanings: from middle-class claims to respectability, wealth, and sophistication in the middle of the nineteenth century, to a marker of full entry into adulthood and financial independence in the early twenty-first century. Where all the world’s cattle, chickens, and pigs are. The dietary crisis in China. The politics of raw milk in the US. The food stamps recipe book. Michael Pollan on Big Food. The growth of the Vietnamese chocolate industry. A Starbucks map of the US. Race, politics, and vanilla ice cream in the American south. Farming at the White House. There is a bar in Sao Paulo named after Osama bin Laden. A tour of the Momofuko Culinary Lab’s Kaizen Trading Company. What your coffee says about you. A history of tea sandwiches. The decline of the cupcake. Anissa Helou on bread in the Middle East. People buy more books when they smell chocolate. What to do with rhubarb. America’s growing enthusiasm for squid. A review of the new Foyles cafe. Lunch Poems by City Lights. Things to make in a rice cooker. The Case of the Unknown Lobsters. I returned to South Africa from the UK a month or so before the 2010 World Cup kicked off. Like a lot of South Africans, I had fairly mixed feelings about hosting the football: although much, if not all, of the infrastructure built for the event would turn out to be useful in the future, I and others were perturbed by the amount of money spent on preparations, and, above everything, by Fifa’s increasingly outlandish demands. Not only were small businesses penalised for using copyrighted words and images, but Fifa required special courts to run during the World Cup. By the opening ceremony, Sepp Blatter was generally known as Septic Bladder. But, in the end and despite him and the (continuing) allegations of corruption levelled at Fifa’s leadership, there was something quite astonishingly wonderful about the World Cup. (John Oliver is particularly good on how it’s possible to love the game, but hate Fifa.) I had begun to suspect that it would be a few weeks of a particular kind of South African madness as I drove to my parents’ to watch the opening ceremony. While waiting at traffic lights, the driver of a hearse leading a funeral procession whipped out his vuvuzela, and blew it at passing traffic. 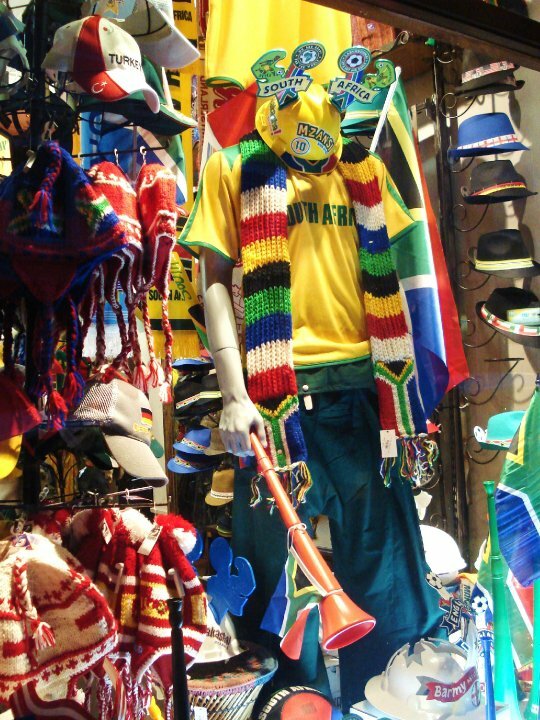 A supporters’ shop in Cape Town’s Long Street during the 2010 World Cup. I think the best example of Fifa’s arrogance was its demand that Brazil lift its ban on drinking in stadiums for the World Cup. Instituted in 2003, this legislation was aimed at reducing violence between rival football clubs. As anyone who’s attended a World Cup match knows, the only beer (actually, ‘beer’) on sale at stadiums is Budweiser, one of Fifa’s official partners. And it was for this reason that Fifa requested that Brazil allow for the sale of beer at stadiums. Unsurprisingly, very high levels of drunkenness have been reported at matches – so much so that even top ranking Fifa officials have noticed, and wondered if they went too far by not limiting beer sales. 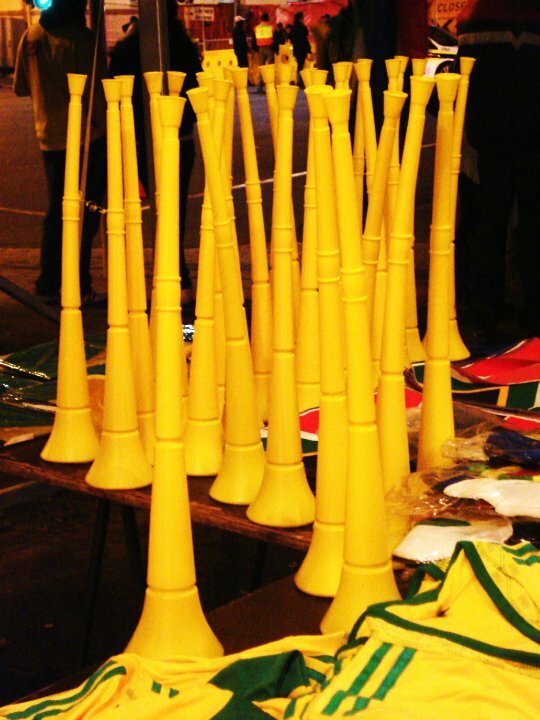 Vuvuzelas for sale in Cape Town during the 2010 World Cup. The visibility and physical presence of these companies and their products is likely to be huge at the World Cup events and side events throughout Rio de Janeiro and Brazil. … Latin America is taking substantial measures to try to introduce healthy food laws to combat childhood obesity. Efforts in countries, including Brazil, have ranged from improving school food options to labelling regulations and advertising restrictions for unhealthy foods. The 2014 World Cup’s food and drink partners and sponsors represent a direct attack on these attempts to better child health. When it is held in developing nations, the World Cup opens up new markets to Big Food. The issue here is Fifa’s disregard for sovereignty. Because it refuses to pay taxes to host nations and demands preferential treatment for its partners, these companies have for a fairly long period of time a substantial advantage over not only local competitors, but over governments and organisations attempting to promote healthy eating. In a time of heightened social, political, and economic conflict – and when public health interventions have the potential to save developing nations millions in healthcare costs – it seems to me that the costs of hosting World Cups are beginning to outweigh the benefits.